Rivlin speaks at ceremony marking 70 years since end of war, tells Jewish veterans they connected Jewish warriors past and future. At an official state ceremony marking 70 years since the end of World War Two, President Reuven Rivlin on Thursday evening memorialized the Jewish soldiers who fought against the genocidal Nazi scourge. "We mark here this evening seventy years since the victory of the free world, over the Nazi beast, and pay tribute to the Jewish fighters who played a part in this victory," said Rivlin in the ceremony at the Latrun Tank Memorial. Prime Minister Binyamin Netanyahu, Defense Minister Moshe Ya'alon and IDF Chief of Staff Gadi Eizenkot also took part. Giving figures about the Jewish contribution to the Allied war efforts, he noted that around 1.5 million Jews served in World War Two, compromising around 8% of the entire global Jewish population at the time, and around half-a-million of them fell in battle. "Jewish servicemen fell as submarine commanders, fighter pilots, tank and infantry commanders, in the engineers and artillery corps, riflemen and regular soldiers," Rivlin said. "In every branch of the military, of each army which fought against the Nazis, were found decorated and dedicated Jewish heroes. No political affiliation, and no Jewish community was absent from the war." 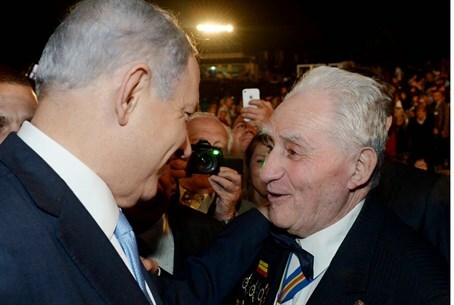 Speaking directly to the Jewish World War Two veterans who took part in the ceremony, he spoke about how their efforts connected to the victory of the Maccabees who drove off the occupying Greek army from Israel over 2,000 years ago. "We look to the past, and beyond you we see the faces of the Maccabees. We look to the future and we see the faces of the soldiers and commanders of the Israel Defense Forces. You are all links in the intricate chain of Jewish heroes, whose roots are in the pages of the Bible, and whose responsibility today, is to the defense of the people and land of Israel," he said. Rivlin stated that the IDF soldiers "are your grandchildren. You have taught them the secret of heroism and humanity, the ethics of battle, and bravery. Your tremendous valor, dear veterans, is deserving of a fitting commemoration." In closing, Rivlin called to complete and inaugurate the museum being built commemorating the achievements and sacrifices of Jewish World War Two veterans.